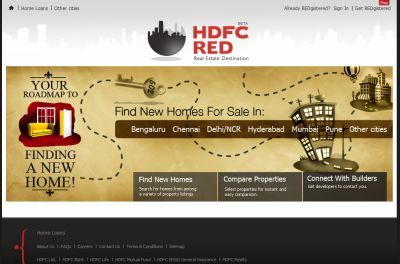 India's largest housing finance company HDFC has forayed into real estate listings space with a website HDFCRed.com. The website has been launched by HDFC's wholly-owned subsidiary HDFC Developers Ltd. The real estate portal will attempt to connect home buyers with brokers. It is currently available in six cities - Mumbai, Delhi, Bangalore, Chennai, Hyderabad and Pune. It appears to target only on buying and not renting or leasing out. Also, they do not have an option for individuals to put up ads of their houses for sale and are only focused on new houses. HDFC's entry may be a threat to existing players as the former enjoys market and brand leadership in the home financing business and also has access to a large database of homes and home buyers. Renu Sud Karnad, managing director, HDFC Ltd, told DNA, "We have a long-standing (close to 30 years) relationship with the top 1,000 builders/developers in the country. Besides, we also know the credibility of these developers to a large extent. These are some of the critical factors that differentiate us from the other players in the market." There are mature real estate websites in India which cater to buyers as well as people looking to rent and lease home or apartments such as 99acres.com by Info Edge (which owns Naukri.com), MagicBricks by Times Business Solutions, Makaan.com by People Group (who run Shaadi.com). There are also classifeds websites such as Sulekha.com and Olx.in in this segment.